The opening is gorgeous: bright citrus and petitgrain grounded by a fair dusting of nutmeg (and if you love just the top notes, do try Le Labo Bergamote 22). The dry down is likewise gorgeous, but softer and calmer. It has a smooth, polished finish — no rough edges — and it's well-blended, in that none of the individual woody and resinous notes (in addition to the palo santo accord, they've listed incense, myrrh, vetiver, gaiac wood, cistus and Atlas cedar) really stick out: it just smells like a dusky incense, middle-weight and mildy earthy, more dry than sweet, meditative but not at all churchy in the traditional sense. The lasting power is very good, but as is often the case with Extrait, it stays rather close to the skin. Verdict: a lovely and fitting tribute, sophisticated but not difficult to wear. Highly recommended for incense freaks, especially those of you who prefer your incense on the dry and quiet side. It's not cheap, but nor is it outrageously priced; if I was still in buying mode, it would go on my list. 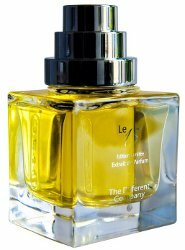 The Different Company Le 15 is available in 50 ml Extrait de Parfum, €139. It was developed by perfumer Alexandra Monet, and is limited edition. For buying information, see the listing for The Different Company under Perfume Houses. 1. Bursera graveolens is in the same family as frankincense, myrrh and copal, Burseraceae. It is now endangered in the wild, and is a protected species in some countries. This sounds surprisingly lovely! Very nice review, Robin. Thanks! “…if I was still in buying mode, it would go on my list.” Me too! I have found it really enjoyable to wear. I’m sure it is due to “extraneous associations” but I really do find incense fragrances comforting / calming, and this one seems especially peaceful. I actually think the reason that frankincense was used in Christian churches is because it is one of the scents that is naturally calming and “meditative.” And, in fact, incense is used throughout the world in several different religions, probably for that reason. So you don’t actually need any particular extraneous associations to have incense fragrances affect your nervous system in calming manner. I find them that way, too, and I was not raised without any religious association with incense. Could be. I would love to know why — you’d think it would be not just the smell but some property in the smoke itself that was calming? Oh, this sounds gorgeous. I haven’t tried any of their more recent releases but I love the original 4, Bergamote especially. I have not loved everything…the Celine Ellena scents esp. just did not appeal to me, other than the De Bachmakov, which is still one of my favorite TDCs all around, even more so than the early 4. Sounds lovely, yes. I’m almost tempted to say that it seems like good value. Hopefully this will be available locally for me. I know they made a limited quantity, but it wasn’t tiny… but I’m afraid I did not think to check in advance on the distribution plans. I know it is for sale on their site already. This perfume sounds delicious; the opening seems almost edible! Thank you for analysing it so beautifully, Robin. I’ve added it to my lengthening list of track-down-and-try perfumes when I’m in TOH. My husband is a tolerant man, but if I attempt even half of The List, he’ll need every molecule of his patience! Sorry, Robin, yes, Austenfan is right. I didn’t mean to be rude: I will be more careful about using my personal shorthand like that. Oh, that isn’t rude at all — we all use shorthand when we can. I just didn’t know this one! This is the first new release in ages that has caught my eye, and I do tend to like the house. You make it sound like it’s worth tracking down! It’s not a big, showstopper sort of fragrance, but I do think it’s worth trying. Yes, it sounds very interesting! This sounds wonderful! It has been a while since a review piqued my interest, but this review definitely does. Hope people will check back in with their thoughts…I have not read much about this one yet. They have TDC at one of the duty-free shops at JFK, I recently discovered! So I did get a quick chance to sample more from the line(but not Le 15) This one does sound nice. I wonder if palo santo is the new oud? I love that duty free spot at JFK! I love TDC, and while dry, austere incensey scents don’t move me much, this sounds kind of delicious and like a must-have for me, especially since it’s limited edition, and ~$160 isn’t a horrible price at all. Joe, this one isn’t really austere, I don’t think, just quiet? See what you think. Your review reminded me that I got a sample of this when perfume shopping last week. The sprayer doesn’t work well and by the time I managed to transfer enough perfume to my wrist, most of the top notes were already gone. So it’s been nothing but incense and wood for me, but I don’t mean it in a bad way. It’s very nice. Coincidence — or not — because I had trouble with the sprayer too. I went to Barney’s yesterday to exchange my Nanban and this was on my list to test. Alas, they didn’t have it yet, but plan to get in October. It sounds lovely. And I still need to try Nanban!